Recently my father downsized from the house he grew up in, to a granny flat-style arrangement at the bottom of the garden. There is no singular doubt which of my parents passed on the You Never Know When It’ll Come In Handy gene. Mountains of conclusive proof was unearthed when Dad required help with the downsizing of his stuff. Which included my grandparents’ stuff: stuff that stayed in the house after they died. The whole experience hasn’t helped with the rationalisation of stuff at my place. And a number of objects that I am not at all sure what to do with, but nonetheless feel a great sense of responsibility towards. I’m at a floral loss. 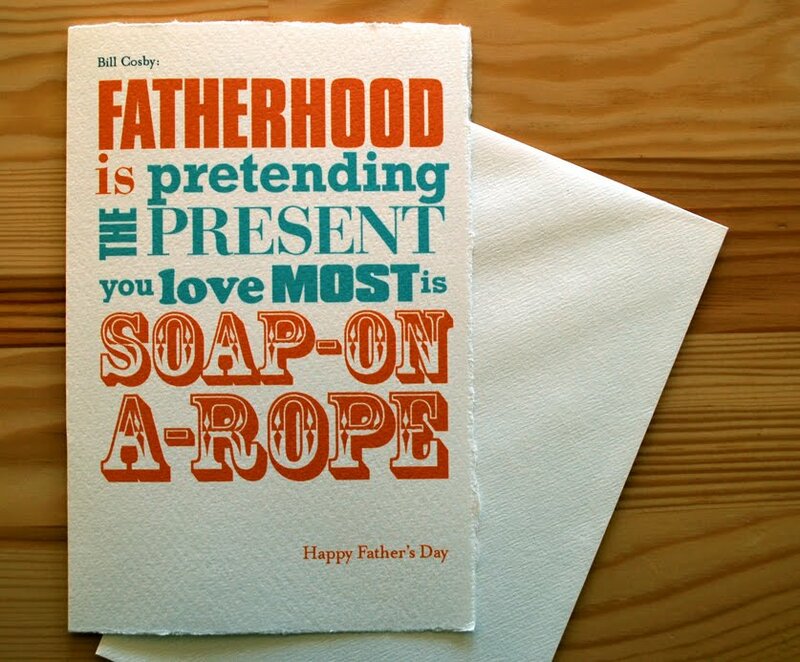 You can find cards for other soap-on-a-rope traumatised Dads here. Oh, my grandmother had those coloured cups. Lime cordial never tasted sooo good. hehehe. Poor old dad ;) Fabulous card. Oh, I would be increasing my stash for sure. Great stuff. Hmmm, I'd go big and blousy and red? or nothing at all! I LOVE that he still had that soap on a rope..
Haaa I almost peed my pants with laughter! My dad had soap on a rope in the 70's and us kids were banned from using it. It hung from the tap chastising us every single day. I love Nana Eunice's recipe books, but I'd love to know where on earth you're going to put that very unusual vase? That is so funny. I saw a soap on a rope in the ALDI catalogue this week and I was teasing my husband about getting it for him for father's day from the boys. I completely missed my husbands real hint. He said he was going to forward me the details of an ipad special deal for father's day. I said, I don't think my dad would want an ipad. Your dad would like it much more than mine, why are you sending it to me? He, he. He had to spell it out for me. Hope you find some lovely new homes for all of your bits and pieces... Lou. Funny. I just KNOW I bought my father soap-on-a-rope back in the day. Coincidentally, I only just told Fixit that I don't want the kids buying me crap from the Mothers Day stall any more; I'd far rather they picked me some flowers or drew a picture than gave me a stupid butterfly pen or candle. I love old-time writing in recipe books. They were so neat! I love that vase! I'd put big, fat white mums in it, or maybe oen or two brilliantly colored gerbera daisies with them! I should rescue my Carmen Miranda Head Vase and put flowers in it, huh? Your Dad wouldn't happen to be Cancerian by any chance? He's been good about the downsizing. Maybe it's better if you know your stuff is in caretaker mode. You can still pretend you have it, which in theory, I guess he does. Nice of him to share, then. My dad still has his set of those coloured cups in their leather holder too, I'm happy I found a set for myself at the op shop. I too have a set of those annodised drinking cups - in a leather holder - they belonged to my grandfather. I love them. Funny what you keep isn't it - or what memory attaches itself to, I also have my Nanna's mincer - I remember her using it in the old kitchen, not that I ever have! Great card. We have those cups too. Such memories in the anodised aluminium! What a gorgeous collection of memory anchors you have. Super love the soap on a rope number. 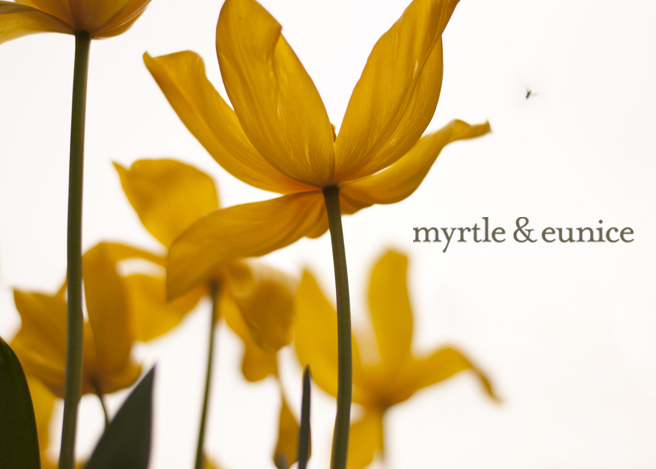 How special to have Nana Eunice's recipes. How I wish I had copies of my late grandma's secret recipes. Now to the vase ... isn't it screaming tiger lillies? 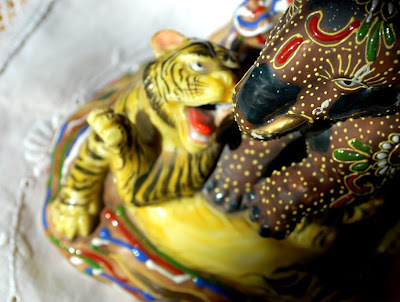 I am always thrilled to see rescued 'vintage' things. Interesting things you rescued, but I believe you found a ton more. 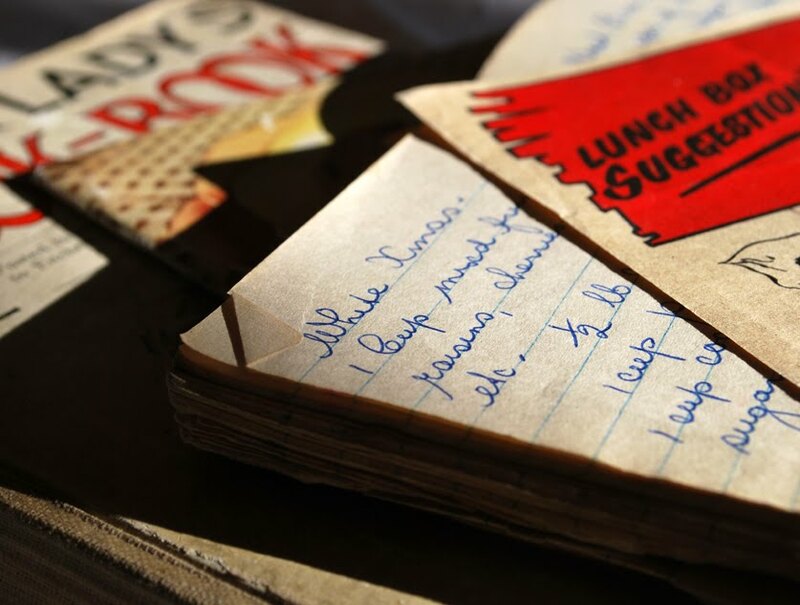 Your granny's recipe books are quite a little treasure! So the 'other family' has finally moved in to the main house? How's all that going? PS The cards are hysterical. I expect nothing less!!! ha! i love those cards. stylish AND funny- a good combination. you're a good daughter. Oh... that recipe book. Treasure. Oh I love soap on a rope .... Your post took me right back to the 70s. I remember thinking how cool would it be to buy my dad a footy soap on a rope. I can picture the exact soap right now in the chemist. I never did buy it. I regret it now. I saw the soap-on-a-rope too at Aldi but I confess, I actually considered buying it as we have no soap shelf (the soap just sits on the corner of the bath turning squishy) and Hubby would never use girly shower gel. I thought cool, I could hang it up on the tap. But now it's just not cool. Thanks for ruining it for me guys. 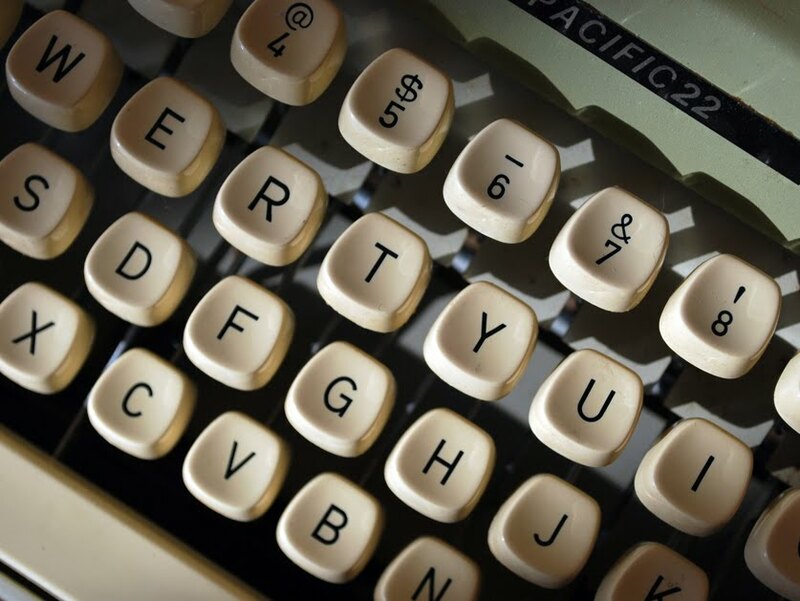 Maybe I can pretend I'm being ironic and retro and still get it. Giving it to him with that card would just back that up, don't you think. Yay, that's one present for the hard-to-buy-for hubby. Love the card, and the story behind it. 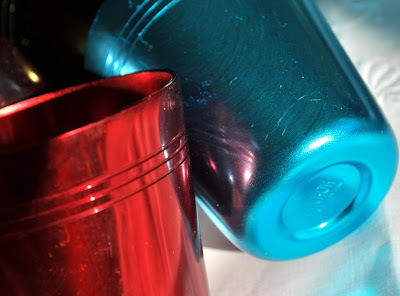 There's something mysteriously great about anodised aluminium cups. I swear lemonade tastes best when drunk out of those cups. Recipe book rescue was very wise . Pure treasure ! 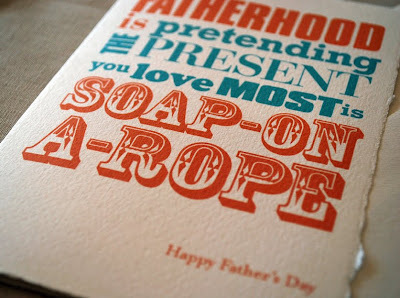 Love the card ..... had quite forgotten soap-on-a-rope .No , to be honest , had deliberately wiped it from my mind . This is great! I can't believe your father held on to that doggone soap all those years! I love it! It is sweet that he felt too guilty to get rid of it! I love your father's day card! that is absolutely hilarious! I'm sure he will get a chuckle out of that! Oh the memories..Nanna's recipe book (yum! ),even that ahem 'elaborate' vase! So what is happening with the house? Great card. Love it so much... loving the picnic wear too! I love the card even more now with the story behind it. Our Dad definitely got soap on a rope! My Grandma had the same picnic ware - great scores! The recipe books - priceless!